Okay, maybe grocery stores, because writers need to buy chocolate in quantity. And eat occasionally. For some writers (not me! ), liquor stores. But bookstores are dear to our hearts. That’s why I intend to highlight some of the bookstores I’ve visited and loved. Although I’ve been around the block a few times, I’m not extremely well traveled. Whenever my wife and I visit a new place, though, one of the first things we do is look for the bookstores. Back when we lived in the wilderness, before the Internet, we’d drive hours to a small town, hoping there was a decent bookstore. Of necessity, though, I’ll have a number from Tucson and Arizona in general. 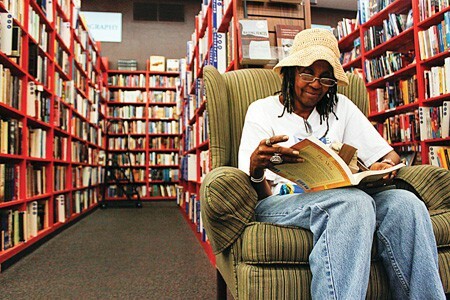 I simply must start this series with the best bookstore I’ve ever loved: Bookman’s in Tucson. 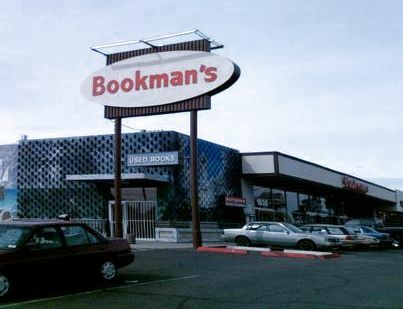 Bookman’s started as used bookstore, though it’s now much more. For one thing, it’s huge. I don’t think I’ve ever gone into Bookman’s and been unable to find something to read. For example, when I started rereading the Hornblower novels I’d read as a teenager, every single volume in the eleven-book series was available. The nicest feature? It’s a great place to exchange books, too. Over the years, I’ve brought in hundreds of books and gotten credit slips for later purchases. They also carry videos, musical instruments, video games, sporting good, antiques—you name it. In fact, they no longer call themselves a bookstore. They’re an ‘Entertainment Exchange’. To me, though, they’ll always be a bookstore. They even have comfortable chairs that encourage you to curl up for a while. For the wife and I, a wild night on the town is visiting the store for an hour or two, reading more than just a paragraph to see if we really want to buy. Heaven! There are three branches in Tucson. Personally, I prefer the Speedway Blvd. store, across the street from where I used to work. The business has been so successful they also have outlets in Flagstaff, Phoenix, and Mesa. My only complaint is that they sell used books. That means the author gets no royalties, so don’t buy any of my books there. For sheer enjoyment, a visit to Tucson isn’t complete without visiting Bookman’s. Tell them I sent you. Oh goody, someone else who like the old sci fi pulps! I used to collect them until I was struck by a lightning bolt that warned me I can’t possibly keep everything that interests me. I like the old sci book, too, especially if their list price is under a dollar. And the old Ace Doubles? Love ’em. Oh yeah Ace Doubles…. (drool) I have about 20 or 30 of them. I’ll admit I haven’t read ALL of the old sci fi books and magazines I have, but I’ve read a few, and I LOVE the cover art on those things. Unlike you I have not yet given up on the notion that I can keep everything I like. (My apartment looks like a used book store, a toy store, a music store, and a movie store all smashed up together.) I’m very tidy and organized though, which is why I am NOT a “hoarder.” Seriously, though. I really don’t get to bookstores, or much of anywhere except the grocery store and the damn auto mechanic these days. Last time I was in a bookstore was closing in on a year ago when I went into a Barnes and Noble to pick up something to read while enduring the eternal wait to renew my driver’s license. Unlike Domingosaurus, I am neither tidy nor organized. I am a sleep-deprived night shift worker. At least that’s my excuse. My cats don’t mind, though. They’re just as happy to sleep on an unmade bed as one that’s pulled together. I assume you read on a Kindle or equivalent? I’m not particularly neat or tidy either, though more so than in my youth. I try to contain my messiness to my office, which is a mess.